Growing up, cousins Alexandra Shimo and Leslie Shimotakahara only saw each other once, at an aunt and uncle’s wedding when they were three and four years-old. The result is an adorable photo of the two girls sitting on the floor in velvet party dresses and Mary Jane shoes. Leslie and her parents moved to Trinidad shortly after she was born and lived there for the first two years of her life while her father’s company was building a steel plant. After, the family moved back to Toronto where Leslie spent the rest of her childhood. Alex was born in Toronto, but raised in London, England with her mother. The next time the cousins would meet face-to-face would be some 20 years later, after the both had travelled all over Canada for school and work. 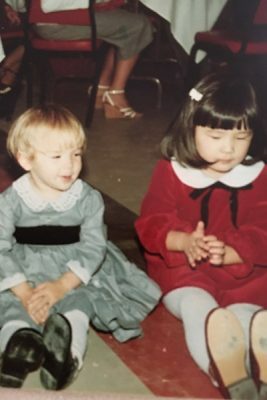 Left: Alex Shimo, age 3 and Leslie Shimotakahara, 4, at a family wedding, the first and only time they met as children. Photo courtesy: Leslie Shimotakahara. 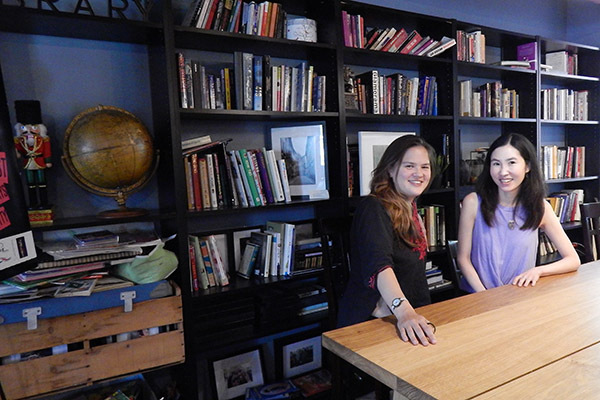 Despite both growing up separately, the two have both chosen to become authors. They took separate paths to get there, but since the two have reunited they found similarities and support in the journeys to be authors. Alex is the author of Up Ghost River and The Invisible North, two non-fiction books that explore the ramifications of residential schools on Canada’s indigenous peoples. 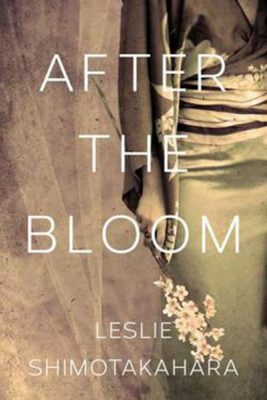 Leslie recently released her debut fiction novel, After the Bloom in May, and has also published a memoir about her father called The Reading List. Now that both cousins are back in Toronto, they have been able to reconnect, share stories and offer support to each other as authors. The pair are second cousins, and share the same great grandfather, Kozo Shimotakahara. Kozo, an issei, is believed to be the first Japanese Canadian physician in Vancouver. He had a practice in Vancouver and also served as the doctor in Kaslo during the Second World War. Leslie and Alex fill in the gaps and finish each other’s sentences as they talk about Kozo, referring to an essay written by Leslie’s grandmother, Ruth Shimotakahara Penfold entitled Issei, based on her memories and recollections about the family’s history. Kozo’s older brother first came to Canada looking to become a doctor, but passed away. Then Kozo came to Canada, his mother gave him all the money she had from selling eggs. Kozo, who was 14, worked as a houseboy and did not speak any English, so he was put in a kindergarten class, Leslie explains. But he was bright, and graduated high school with his age group and studied at the University of Chicago. Because of Kozo, education has always been important in the Shimotakahara family, says Alex. “For me there was a sense that education was a privilege, and I think that definitely influenced my choices and where I went to school. And I think that’s probably true for a lot of Japanese Canadian experiences,” says Alex,. She studied politics, philosophy and economics at Oxford University in England and received her masters of journalism from Ivy League Columbia University in New York. There also was always a push from both Alex and Leslie’s families to pursue a career in science and medicine. Alex’s father is otolaryngologist, or a doctor who specializes in ears, nose and throat, and she would intern at his office every summer. Realizing pursuing a medical career wasn’t for her, Alex decided to become a journalist and has worked for CBC and Maclean’s. Then she decided to pursue the tumultuous career of freelance journalist and author. It wasn’t until she was a finalist for the 2014 Governor General’s award for her book, Up Ghost River that her father stopped suggesting medical school, says Alex, laughing. Leslie also found herself on the trajectory to becoming a doctor. Being good at maths and sciences, Leslie went to McGill University to study sciences with the goal of getting into medical school. Favouring her only elective of philosophy, and missing her arts and English classes, Leslie says she decided to change her degree to English. She also has her PhD in English from Ivy League Brown University in Rhode Island. Both Alex and Leslie have found inspiration for their writing from their Japanese Canadian heritage. The cousins have both been fascinated since childhood with their families’ histories, and the lasting legacy that internment has left. “I think that one of the key drives of my writing was to understand my family’s past, and explore imaginatively that history that has always been very rich in my mind,” says Leslie. In her debut novel, After the Bloom, a woman named Lily searches for her missing mother, Rita. Lily uncovers secrets about her mother’s past and things she’s never talked about, like her experience at an internment camp in California. The character of Rita is very much shaped by Leslie’s own maternal grandmother, who was interned in a camp in Idaho, and refused to speak about her experience ever for the rest of her life, says Leslie. Alex was also fascinated by a grandmother who rarely spoke about internment and also suffered from depression, curious as to whether there was a connection between shame and withholding secrets from the past and mental health. She says she saw writing as an opportunity to create a safe space to talk about wounds from the past. Seeing a connection in experience with the indigenous communities in Canada, scarred by the Canadian government, to the Japanese Canadian community, and how sharing these narratives can lead to healing. She began writing about indigenous experiences in the hopes of helping educated and heal some of the damage caused by residential schools. 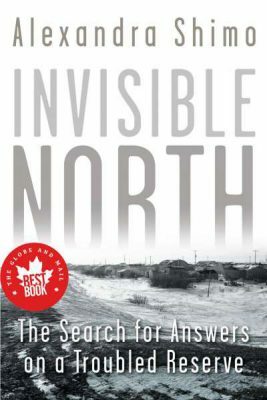 Fascinated by the idea of divorcing hope from reason, Invisible North tells the stories of the troubled reserve Kashechwan. Having another writer in the family has helped provide support in a career that can be very isolating at times, says Alex. When Leslie decided she wanted to leave her job as a literature professor at St. Francis Xavier University in Antigonish, N.S., Alex encouraged her to take the leap. “It’s very helpful to have other people around you, especially people who you admire and inspire you and you know who understand why you are doing it, and not pressuring you to be a doctor every five minutes,” jokes Alex.